For a year now, Palestinians in Gaza have been creatively and bravely protesting for their freedom by marching toward the border fence with Israel to demand an end to the blockade of Gaza and respect for their rights. In response, Israel has met unarmed civilians with live sniper-fire, killing over 200 and injuring tens of thousands, including paramedics, journalists, children, and people with disabilities. In total, 45 children have been killed. When it convened in Geneva in March, the UN Human Rights Council condemned Israel’s “apparent intentional use of unlawful lethal and other excessive force” against protesters in Gaza. A commission of inquiry formed by the human rights council found that Israel’s use of lethal force against protesters warrants criminal investigation and prosecution and may amount to war crimes and crimes against humanity. Christ-followers are eager to serve and obey God to the best of our ability and knowledge. When there are gaps in our understanding, it behooves us to “grow in wisdom.” For example, what does the Bible say about the Promised Land and God’s chosen people? We invite Jews doing a Passover Seder and Christians having a celebratory Easter dinner to consider adding shoelaces on our Seder Plate or Easter dinner table–to recall the fate of refugees, migrants, and asylum seekers. 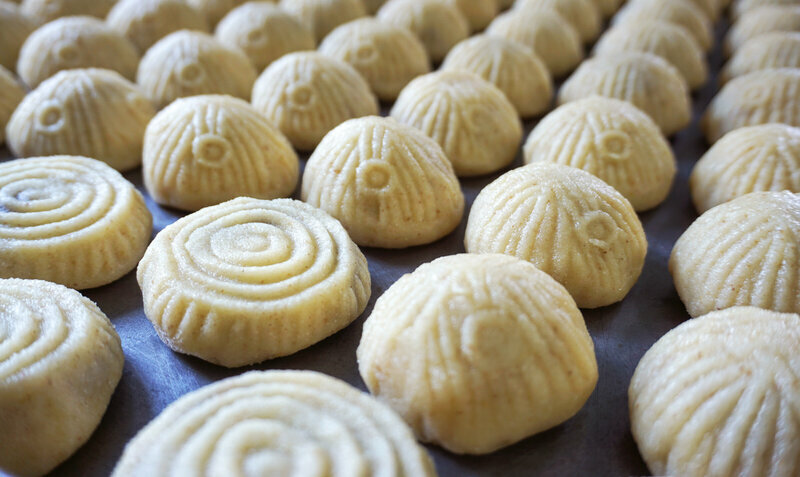 Be it Easter or Eid, holidays in the Levantine region of the Middle East are incomplete without a shortbread cookie called maamoul. Stuffed with date paste or chopped walnuts or pistachios, and dusted with powdered sugar, these buttery cookies are the perfect reward after a month of fasting during Ramadan or Lent. On April 7, more than 170 young people from different places in the Holy Land responded to a Franciscan initiative for a meeting of young people during the Lenten period. Departing from the monastery of St. George, they crossed the narrow alleys of Wadi el Qult to reach Jericho. George Thaljiyeh, despite losing his sight, sees with his heart. Thanks to his developed senses, he is able to write down what the eye cannot describe. Through his imagination, George is able to express what happens in his mind and the impressions he experiences in everyday life with his friends. I am writing this in response to some comments I saw on Facebook from friends of mine about Gaza. I grew up thinking that Palestinian lives don’t matter. The reason for my belief was that while growing up I saw many people in my town and my country get killed by Israeli soldiers (and they still do). These were teenagers mostly. Nothing was done to punish the killers and nothing was said about it in the Israeli media. If something was said, it was a story that did not resemble reality. Latin Patriarchate of Jerusalem – On Saturday April 6, 2019, and on the occasion of the 42nd National Convocation of the renewal in the Holy Spirit (RnS) in Rimini, Archbishop Pierbattista Pizzaballa, Apostolic Administrator of the Latin Patriarchate of Jerusalem, presided over the Eucharistic con-celebration.